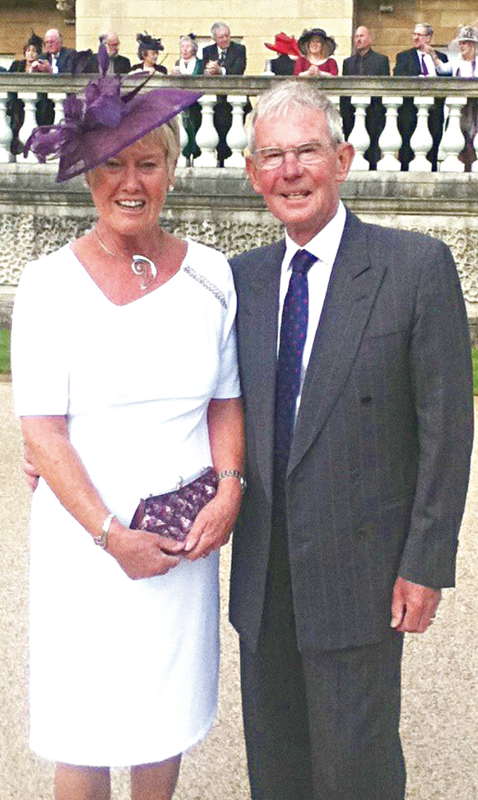 A FUNDRAISER and volunteer for Woking & Sam Beare Hospices was recognised for her services to the community with an invitation to the Royal Garden Party at Buckingham Palace. Virginia Edwards, who has spent the past 25 years giving her time and energy to support the hospices, was joined by her husband David at Buckingham Palace for the prestigious occasion. Volunteers from across the country enjoyed music, tea and cake in the presence of The Queen and the Duke of Edinburgh. Throughout her time volunteering, Virginia has taken part in sponsored swims, walks and held fundraising events at home. Having been involved from the outset when the new hospice for Woking was proposed in 1990, dedicated Virginia obtained authority for door-to-door selling for the first Car Raffle, and has concentrated her efforts on developing this direct contact with the public through which she raises around £12,000 annually. Proudly stepping out in style, Virginia was delighted to take some time off from her busy schedule and enjoy the party at the Palace. Marketing Assistant for the charities, Sameena Iqbal, said: “For many people in the community Virginia is seen as their link with the hospice; her efforts are greatly admired by the public and she has brought forth many other volunteers, raising an exceptional amount of money.